Definition at line 107 of file llpanelavatar.h. Definition at line 268 of file llpanelavatar.cpp. Definition at line 301 of file llpanelavatar.cpp. References LLPanel::childSetTextArg(), LLPanel::childSetValue(), LLScrollListCtrl::deleteAllItems(), LLUICtrlFactory::getScrollListByName(), LLUICtrlFactory::getTexturePickerByName(), mPartnerID, LLStringBase< char >::null, LLUUID::null, and LLTextureCtrl::setImageAssetID(). Definition at line 334 of file llpanelavatar.cpp. References LLPanel::childSetEnabled(), LLPanel::childSetVisible(), LLUICtrlFactory::getTextEditorByName(), LLTextEditor::setReadOnlyBgColor(), and LLColor4::transparent. 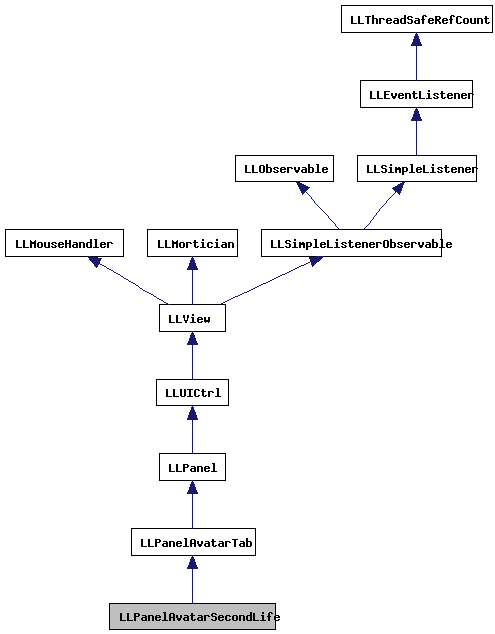 Referenced by postBuild(), and LLPanelAvatar::setAvatarID(). Definition at line 355 of file llpanelavatar.cpp. Definition at line 384 of file llpanelavatar.cpp. References LLViewerWindow::alertXml(), gViewerWindow, NULL, and onClickPartnerHelpLoadURL(). Definition at line 390 of file llpanelavatar.cpp. Definition at line 378 of file llpanelavatar.cpp. Definition at line 359 of file llpanelavatar.cpp. References LLScrollListCtrl::getFirstSelected(), LLUICtrlFactory::getScrollListByName(), LLScrollListItem::getUUID(), llendl, llinfos, LLUUID::notNull(), and LLFloaterGroupInfo::showFromUUID(). Definition at line 418 of file llpanelavatar.cpp. 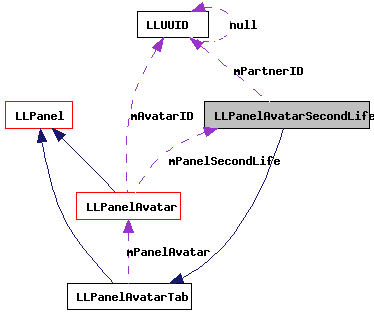 References LLPanel::childSetAction(), LLPanel::childSetDoubleClickCallback(), LLPanel::childSetEnabled(), LLPanel::childSetVisible(), enableControls(), FALSE, gAgent, LLPanelAvatar::getAvatarID(), LLAgent::getID(), LLPanelAvatarTab::getPanelAvatar(), LLPanelAvatar::onClickAddFriend(), LLPanelAvatar::onClickIM(), LLPanelAvatar::onClickMute(), LLPanelAvatar::onClickOfferTeleport(), onClickPartnerHelp(), LLPanelAvatar::onClickPay(), onClickPublishHelp(), LLPanelAvatar::onClickTrack(), onDoubleClickGroup(), LLPanelAvatar::sAllowFirstLife, and TRUE. Definition at line 276 of file llpanelavatar.cpp. Definition at line 129 of file llpanelavatar.h. Definition at line 281 of file llpanelavatar.cpp. References LLPanel::childSetTextArg(), first, gCacheName, LLCacheName::getName(), mPartnerID, and LLUUID::notNull(). Definition at line 132 of file llpanelavatar.h. Referenced by clearControls(), setPartnerID(), and updatePartnerName().